For the romance-comedy fan, the name Jun Maeda has at least influenced your viewing experience. Jun Maeda is one of the lead story writers of Visual Kei, the famous visual novel company that has produced works such as Clannad, Kannon and AIR, all of which have been adapted into very successful anime series. Not content with just influencing the romance genre from the shadows, Angel Beats! is the first series that Jun Maeda has written from scratch and directed. How well does it stack up to all the previous masterpieces that he’s been a part of? 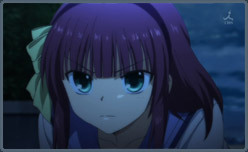 The short and simple answer is that Angel Beats! is just as good, if not better than anything else we’ve seen that Maeda-san has been involved with. At the same time, the answer really isn’t all that simple. Angel beats! is a show with great emotion and heart, that really does tug at your heartstrings, but it is not a romance show. 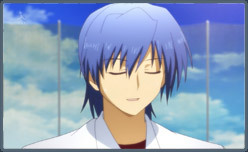 Being something totally different, and actually covering a new topic of leading life and death, and doing it so well, with such heart and feeling, is the real accomplishment of Angel Beats! Angel Beats! centers around Yuzuru Otonashi, a young man who wakes up in a strange world only to find that everyone there has actually died. He asked by Yurippe, a girl who leads the “Afterlife Battlefront” to join in the rebellion against God, as everyone here doesn’t accept death and fights against it. In opposition to the Battlefront, is a young girl, who they term as the “Angel”. Otonashi reluctantly joins the Battlefront, all the while, trying to get his memories and make sense of what is happening. That’s the general starting anyway. Angel beats! introduces a handful of plot twists in the first few episodes alone, and there are a good bunch of surprises all the way till the end. There’s a belief, that too many plot twists make a story convoluted. This series begs to differ, with an amazing plot filled with twists and turns. The story in Angel beats! is one of Jun Maeda’s best works by far, and it is in uncharted territory as far as anime series go. 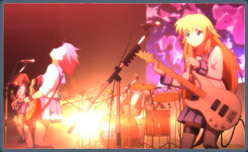 Instead of focusing on events during one’s life, the core theme of Angel Beats! is all about looking at life in retrospect. 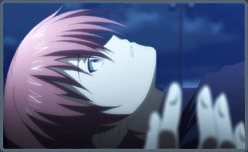 The whole concept of the afterlife, and what one may experience after death, is something that Angel beats! is a pioneer of, and we’ll likely see other future shows use this idea to new ends. While the show is indeed very strong and emotionally charged, there’s a good dose of comedy to keep things from going too dark. The comedy is handled rather expertly, and never really detracts from the main themes of the story, rather, it adds a great deal of entertainment to an already strong show. 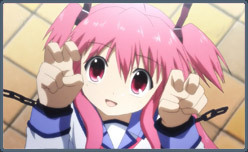 Its debatable whether Angel Beats! would be able to stand firm without its comedy element, as the shows funny moments are so expertly entwined and fixed into the core of the show’s appeal. Of course, calling Angel beats! story perfect is something that is hard to do. 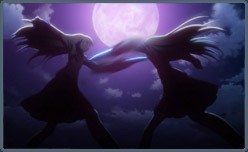 If anything, a big feeling that is prevalent near the end of the series is that there just wasn’t enough time to properly make Jun Maeda’s epic into what it was intended to be. A lot of the characters’ stories are pushed aside in favor of the main characters and the series own quick resolution. Some of the series back-story is also left up for a prequel manga to address. At the end of it all, Angel beats! makes you feel like you’re only experiencing a chunk of a much grander, amazing story. If only anime series these days would be allowed 50 episodes or more like the good old days. Alas, Angel beats! only has 13 episodes to tell its tale, and while it can’t do justice to every plot point and finish every little detail, what it does, it does exceedingly well, and does so with flare, comedy and some good old tear jerker moments. In a show that is both emotion driven and funny, it becomes essential that the characters in said show be superb. Indeed, Angel beats! has an amazing cast of characters. Each character has defining traits, is unique and above all, likeable. There isn’t a single character in this show that feels annoying, outdated or cliche’, which is an accomplishment in itself. There is the exceptional main character Yuzuru, the bossy and charismatic Yurippe, the funny and cool best bud Hinata, to the exceptionally weird T.K, Angel beats! has an impressive collection of characters. And while the story is indeed strong in this show, it is crafted in such a way that it focuses and highlights its characters expertly. While the story and characters are amazing, the actual production and presentation of the show is where there are a few rough spots. The animation in particular, is downright ugly at times, especially in the starting episodes. That’s not to say that the animation is horrible throughout, as some scenes are clearly expertly animated. It just seems like the show either didn’t have enough of a budget or the budget management wasn’t smart enough. Whatever the case, there are some rather obvious parts of the show where the animation sticks out as a sore thumb. The Art style, is the typical Visual Kei stuff that we’ve come to see in previous shows done by Kyoto Animation. It works well here, and while it’s nothing new or original, that’s hardly a problem. If its not broken, why fix it? It is worth noting though, that some of the character designs do feel borrowed from other more known anime(, particularly that of Yurippe). The sound work is exceptional though, with an impressive score and amazing Opening and Endings songs. The voice acting is also superb, something that is often overlooked since most shows have great voice work these days, but it is worth commending the seiyuu (voice actors) on their performance, which add extra depth to the already impressive characters. At the end of it all, Angel beats! is a show that is recommendable to any anime fan who’s liked funny, emotional stuff like Clannad, AIR or Kanon. While it definitely feels like Maeda-san was not given the due budget and episode count that he deserved and needed, Angel beats! still manages to become one hell of a ride, with 13 amazingly entertaining episodes that finish on a high note. The show isn’t without its flaws, but what’s impressive is that none of these flaws matters in comparison to the shows amazing strengths. We very much welcome Jun Maeda’s more direct involvement with the anime industry, and give this show an A Grade.